A Mobile Dog Walking Service, we pickup and walk your dog in the greater Johnsonvil­le / Newlands area, Wellington North. We're offering Dog Walking during the day, while you are out earning the dog biscuits for Rover! Dogs are encouraged to walk on a loose leash, sit and wait on the curb before crossing the road etc... Training given if required. 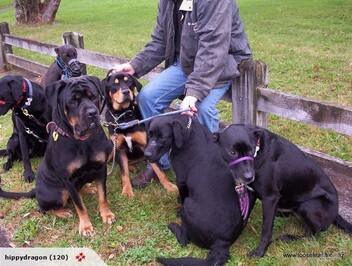 Dogs are run free off the lead at Off Leash Dog Exercise Areas, once we are satisfied with their Recall. Pack Walks are much enjoyed at Off Leash Dog Exercise Areas such as Trelissick Park. Ask about our Fat Dog Slim program. Water bottle & bowl carried, poo bags carried, & used! Wet paws & wet dogs toweled off on return, petting, tummy, chest & ear rubs included. to schedule your "FREE meet & greet ", & walks. P.S. print or Bookmark this ad - thank you! Find us on facebook and "Like" to follow and see what we do. A little about us, we are in our early 50s and have been married 30yrs, with 2 adult children. We grew up with dogs and have been around them our whole lives, we have had a German Shepard, Doberman's, Doby X, Doby/Rottie/Mastiff X's. or supply me with a key for access. We can't speak highly enough of Penny & Phil and often recommend them to new puppy parents. We also enjoy and look forward to the regular photos of KIt (cavoodle) and Pippa (schnoodle) on there twice weekly adventures with Loose Leash. I can't recomend penny and phil enough. They really seem to enjoy and care about dogs. My blue boy is much more relaxed since they've been involved. Very professional and reliable. thanks guys! I'm very luck to have found Penny & Phil, they are wonderful with my puppy, in just one hour, they had made such a noticable difference to him walking nicely on a leash without pulling, this makes it so much easier when I take him for walks, as I used to be so tired after just a short walk. they have such a wealth of knowledge about dogs, which they share freely. My dog also gets to socialise with other dogs. They are a lovely couple and I have no hesitation in recommending them. Thanks Penny for putting me on to someone whom is closer to town for me. Very generous person! Texted Penny late Sun night for some info & she kindly texted me back when she got home, & found the stuff! Penny & Phil Krieg: My pleasure, the things we do for our Dogs ! I've been using Loose Leash Dogwalking for almost a year and a half now ever since my greyhound girl was a young 3 month old pup. Penny is always reliable and has been such a great help with advice, training and socialising Josie with her other Loose Leash regular buddies, as well as general walking/park runs. Great value for money too - sometimes Josie is gone for hours! She always comes back tired and happy. I highly recommend Penny and Phil.